JUNE 7, 2016 - New Yorker Electronics is expanding its line of high-power resistors with the distribution of the Vishay Dale Thin Film PCAN Series of Resistors. 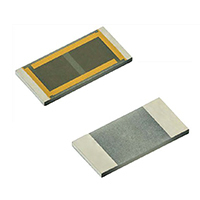 Built on aluminum nitride substrates, Vishay Dale Thin Film PCAN Series High Power Aluminum Nitride SMD Resistors offer power ratings to 6W and resistance from 2Ω to 30kΩ in 1206 and 2512 case sizes. They are optimized as snubber circuits and burden, gate load and amplifier termination resistors in industrial, military and medical applications. Other applications include power supplies, power switching and braking systems. The PCAN series of chip resistors, a 2016 Vishay Super 12 Featured Product, is designed on aluminum nitride ceramic substrates with enlarged backside terminations to reduce the thermal resistance between the topside resistor layer and the solder joint on the end user's circuit assembly. Features of the thin film resistors include a resistance range up to 175Ω, tolerance to ±0.1% and TCR down to ±25ppm/C. Actual power-handling capability is limited by the end-user mounting process. As with any high-power chip resistor, the ability to remove the heat is critical to the overall performance of the device. The Vishay Dale PCAN Series of resistors is among the 2016 Vishay Super 12 Featured Products. New Yorker Electronics is a franchised distributor of Vishay Dale electronic components and carries the entire line of Super 12 products.